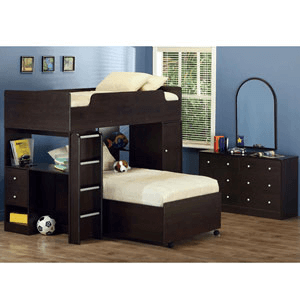 3-Pc Junior Loft Bed In Cappuccino Finish. Loft Bed Features Upper Bunk(Bottom Bed Not Included), Storage Drawers, Book Shelves And A Desk. This Set Features Soft Profile Molding For All Rounded Corners, Metal Drawer Glides And Metal Drawer Pulls. Also Available (Sold Separately) Matching Single Bed, Nightstand, Wall Mirror, 6-Drawer Dresser, 5-Drawer Chest And 4-Drawer Chest. Strong Construction. Easy To Assemble.